Home Beers Sacramento Brewing Co.
Hefe Weizen | Sacramento Brewing Co.
12oz bottle from a six pack from the Elk Grove BevMo. Maybe it's just me, but I like the new labels that SBC has put out. I don't really know if it's a recent thing, though. A beautiful fraulien in german serving-girl attire, sort of a comic book/anime version of the St. Pauli girl, leaning on the Hefeweizen banner across the bottle. Part of a mountain range and lake or river in the background.Definitely eye-catching. But what's inside counts, am I wrong? Pours a hazy bright golden into my Sierra Nevada Wheat beer glass. Surprisingly little head was generated. And the frothy stuff pretty much vamoosed in seconds, leaving no lacing in it's wake. Smells of overripe bananas, just a little bit of grain. Tastes of banana sweetness, with a bitterness that detracts from the overall drinkabilty. Not too impressed. There are better, more readily available hefeweizens out there. Presentation- 22 oz bomber bottle with a print of a steamboat on the label. Poured into my Ayinger weisen glass. Appearance- Pours with a decent head, a nice golden color and light lacing. Smell- Heavy sweet clove scent along with a bit of grain. Maybe some ripe bananas in there too. Taste- Cloves, banana's, a few other spices. Way to bitter for me though. Mouthfeel- Very carbonated as most hefe's are. Medium body and a not very creamy. Almost seltzery. Drinkability- Not a top notch hefeweisen. Too bitter and not as smooth as others. Sampled on site. Poured a hazy burnt yellow color that is lightly cloudy. There is a fuzzy head and limited lacing. The aroma is good for a hefe. Strong fruity banana and orange notes are present. Some malt presence but not much wheat nor spiciness. The taste has a more wheat flavor then the nose would indicate. The fruitiness was still noticed but toned down will a little more balance. Still not much on spices and a light touch on some citrus almost grassy touches at the end. The body was light but acceptable. Overall this is a good session beer. Pours a slightly cloudy yellow. Weak white head, likely killed by the lemon it was served with (blah). Sticky lacing. Smells of oranges, tangy wheat. Reasonably freash smelling. Citrusy, slight cardboard flavor. Tangy and quite dry. Mild banana and bitterness on the finish. Thin to medium bodied. Drinks ok. Bitterness and dryness a bit odd for the style. On draft at Dawsons Restaurant at the Hyatt Regency Hotel in Sacramento it came in the correct glass with a lemon slice hanging on the edge. I drank it but had to order a second without the lemon so I could rate ti. It was golden yellow, and had only the slightest cloudiness being almost clear with a whtie head and minimal lacing . Nose was banana and somewhat sour. Mouthfeel was medium and flavor was yeasty, banana,. and cloves. Finish a little sweet but nice. A very good rendition of a German Hefe. I hate to admit this but this is the first beer I have ever poored out. When I opened it I noticed a not so nice smell, I first thought the beer was bad but when I poored it it looked alright. I put myself over the smell and took a sip... nothing, then a nasty feel in my mouth. I like a good hefe but this is not it. I gave it 2 more sips before I got rid of it, not pleasant at all. 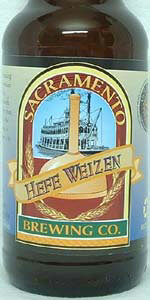 Hefe Weizen from Sacramento Brewing Co.